Peruse any bookstore. Inspiring stories of triumph over cancer and tales of subsequent total life transformation abound. Heck, check out the hospital room window ledge, the oncologist’s waiting room, or the coffee table of anyone diagnosed with cancer and you will almost certainly find piles of these “go get ‘em” books bequeathed to patients by their well-intentioned friends upon hearing of their diagnosis. When faced with a friend who is ill, buying a book for him or her is a caring and thoughtful response. Right? Perhaps not. Perhaps the person diagnosed with cancer should be handing the friend a book. 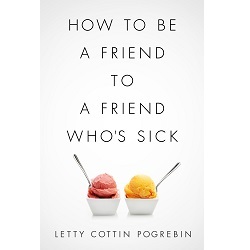 As Letty Cottin Pogrebin so eloquently elucidates in her book, How to Be a Friend to a Friend Who’s Sick, friendship in light of a cancer diagnosis can be tricky. What no book had ever addressed before was how to tell your friends how to behave when you or a loved one is facing a medical illness. Pogrebin finally offers an invaluable reference. Pogrebin, an esteemed author and founding editor of Ms. Magazine, wrote this book after considering her own friends’ highly variable responses to her breast cancer diagnosis. During her own cancer treatment, Pogrebin observed her fellow patients in the hospital waiting room and wondered about their friends’ responses. Pogrebin searched for a book to help her better understand friendships in the context of cancer, and, having come up empty, she decided to write the book. Through her extensive interviews with her fellow patients, friends, strangers, and reflections on her own illness experiences, Pogrebin offers a long overdue roadmap to the legions of friends who want to help when illness hits. When illness strikes, even the most socially adept can be unprepared for how to act, what to say, what to bring, and what to do. Through interviews and anecdotes Pogrebin offers the “dos” and “don’ts” in terms of illness etiquette. Pogrebin’s insights are spot on. In chapters titled, “I Can’t Believe You Said That,” “The Perfect Present,” and “How to Give Good Visits,” the book expounds upon subjects such as how to visit a sick friend, select an appropriate gift, offer comforting words, and avoid hurt feelings. With candor and humor, Pogrebin’s book addresses even the most sensitive issues of grief and loss and how to comfort a bereaved friend. Even the most experienced patients, survivors, and helpers among us will find ourselves nodding in agreement with the book’s suggestions and cringing knowing we are guilty of some of the books “don’ts.” The comprehensive resource list contained in the book’s appendix offers everything one could need to comfort a friend, from cancer humor to fictional stories to caregiver support services. As a psychologist who specializes in helping patients and families navigate cancer and other illness crises, I am privy to what patients do and do not want from their friends. I spend endless hours hearing tales of friends who tried to help, those who shied away, friends who rose to the occasion, and those who failed miserably. I spend a lot of time helping patients and families communicate their actual support needs to their loved ones. Oftentimes, these needs are vastly different from the things friends think are thoughtful and loving gestures. While so many books are filled with stories of the “unlikely bright side” of a cancer diagnosis, the “must-do” lists of ways to beat the disease, and “must-have” products to make treatment more tolerable, books themselves cannot provide true acts of friendship. Ideally, each newly diagnosed person should be given a stack of Pogrebin’s book, How to Be a Friend to a Friend Who’s Sick, to give freely to their friends and acquaintances. It’s a gift that speaks for itself. Indeed, this is Pogrebin’s vision. I couldn’t agree more. Dr. Stephanie Ross is a clinical health psychologist and founder of Illness Navigation Resources, a consulting service that assists patients and families with cancer and other health issues access resources and support. Dr. Ross finds particular satisfaction in being able to "reassure people that whatever emotions they are experiencing are relevant and valid and in being able to connect patients and caregivers to the many invaluable resources that exist to help support them."